I’ve already posted about the difference between swiss waists, waist cinchers, corsets & corselets. This week, I’m going back in history, and back to basics, to discuss the differences between stays, jumps & corsets. Stays, was the term used for the fully boned laces bodices worn under clothes from the late 16th or early 17th century, until the end of the 18th century. 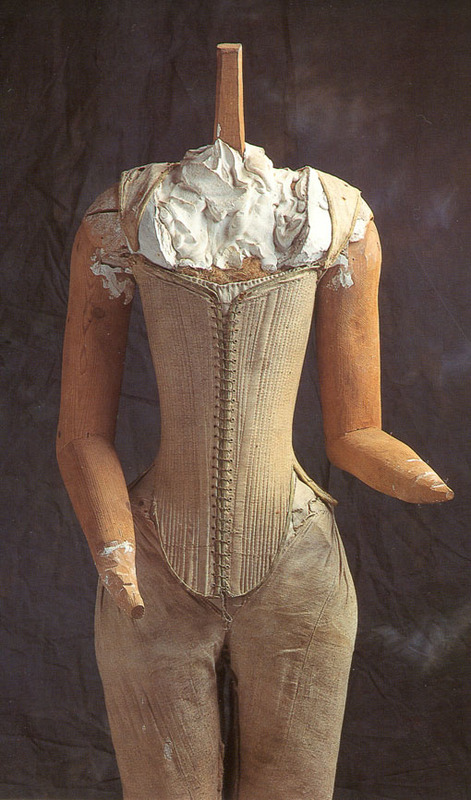 Before this boned garments were called (in English at least) a ‘pair of bodies’ – for each side of the stays. The term stays probably comes from the French estayer: to support, because that is exactly what stays did. Stays turned the torso into a stiff, inverted cone, raising and supporting the bust, and providing a solid foundation on which the garments draped. Despite their heavy boning, and how stiff and constricting they may seem to modern eyes, stays were originally seen as more informal wear, as opposed to garments with the boning built in, such as the robe de cour. Stays were more commonly worn in England than in France. 18th century visitors to England consistently commented on how even the peasants wore stays, though they might only have one pair (often leather) which was worn constantly without washing. In France the peasants, in general, appear to have gone without stays, and even among the aristocracy stays, though usually worn, were only mandatory at formal court functions. Even then, a lady could be excused from wearing them if her health made them inadvisable. Throughout the 18th century there were fashions that allowed women to go stayless: the robe battante could disguise an un-supported body, though wearing one too long might cause rumours of pregnancy or simply create an impression of slovenliness and laxity of morals. Stays were a literal symbol of a woman’s uprightness and virtue. Jumps were softer, significantly less boned (and sometimes completely unboned), bodices or soft stays which still provided some bust support, but did not shape the body into such a ‘elegant’ cone shape. They laced up the front, and thus were easier for a lady to put on and take off by herself. 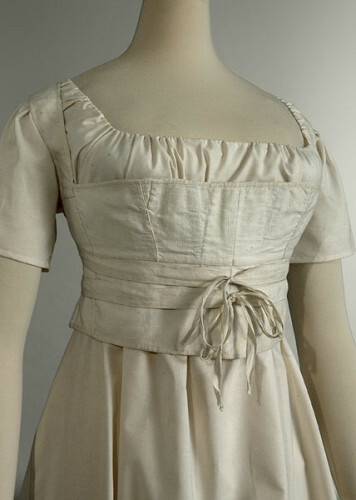 Originally used for informal wear at the start to the of the 18th century, they were worn throughout the century as a more comfortable alternative to stays, and became more popular at the end of the century with the change in fashion from the elaborate 18th century styles to the softer neoclassical styles. As the fashions changed and the popularity of jumps rose, other forms of soft undergarments also evolved. Among these was the corset. The one problem with terms like ‘jumps’ and ‘corset’ is that we’re not always sure which garments would have been called what at each decade. Fashion has always been a spectrum, and it is quite likely that one woman might have a garment which she would call jumps, while another would call the item a corset. The yellow waistcoat posted above is a good example. 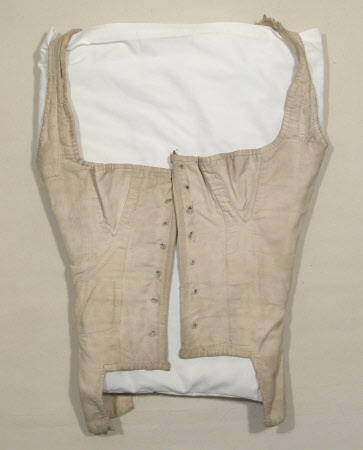 Garments that fit an identical description are described as jumps in the mid-18th century, but so are significantly more structured undergarments. Modern costume historians sometimes use terms like ‘transitional stays’ to describe the garments between heavily boned stays and the longline corsets of the 1810s etc, but of course this is not a term that would ever have been used in-period. 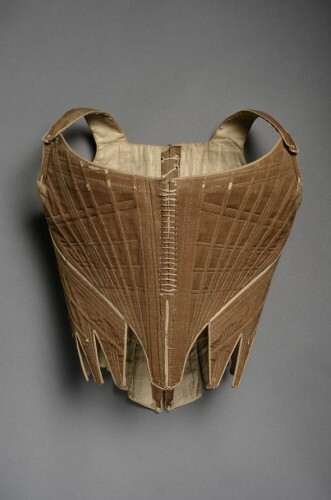 Other terms of supportive undergarments seen as fashion went through a series of massive chances in the last decades of the 18th century and the first decades of the 19th were (in roughly chronological order) short stays (for short, lighter boned stays), bust bodices (for boned, wrapped proto-bras) and demi-corsets (shorter, lightly boned corsets used for informal wear). As waistlines dropped in the late 1810s, boning returned to undergarments. 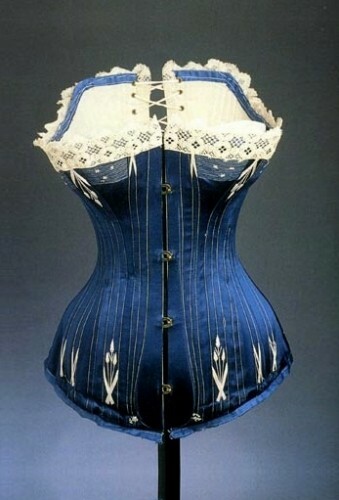 Corset, however, remained in use as a term for supportive undergarments, but now referring to the more boned, waist-cinching undergarments, rather than the soft waistcoats they had originally indicated. 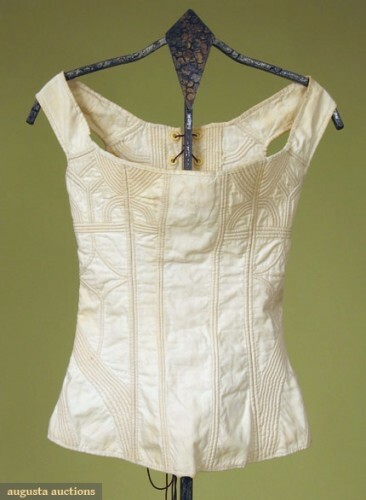 Stays and corsets were used quite interchangeably in the early decades of the 19th century. A training manual for ladies maids written in 1825 describes the garments as “…stays, corsets, or whatever other name may be given to the stiff casing that is employed to compress the upper part of the body”. As the 19th century progressed, corset became the more common term for the boned, laced garment, but the term stays remained in common usage, both for the garment, and even more so, for the actual pieces of bone in the corset. There are frequent uses of the term ‘stays’ as a synonym for corsets into the early 20th century, sometimes for its pun potential, with amusingly dreadful results. It has only been in the 20th and 21st centuries, long past the days of constrictive undergarments being commonly worn, that we have abandoned the word ‘stays’ as a synonym for corset. As historical costumers we use ‘stays’ almost exclusively as a term for 17th & 18th century boned undergarments, but historically speaking we would be just as correct to say “my new stays are the most comfortable pair I’ve made yet” about an 1880s corset. Baumgarten, Linda. Eighteenth Century Clothing at Williamsburg. Williamsburg: Colonial Williamsburg. 1986. Delaney, Mary. Autobiography and Correspondence of Mary Granville, Mrs Delany: With Interesting Reminiscences of King George the Third and Queen Charlotte. Cambridge: Cambridge University Press. 2011. Steele, Valerie. The Corset: A Cultural History. Yale University Press: London. 2001. As always, you are the master of finding things! Usually I google and come up with stuff, but I was so tired of this post by the end! Learned so much! Thanks for sharing all of your research! Thanks for the history lesson; I was not previously aware either of how the terms “stays” and “corset” came into use or when they became synonymous. I agree, such interesting info! I was wondering also, is there some kind of pattern to the difference of when these garment were worn over the clothes/chemise as outer wear (long before Madonna did it!) and when they were considered as underwear? Was it a class thing, a cultural thing or a period specific thing maybe? That yellow quilted number reminds me of the kind that Maria wears in a scene from Sound of Music, which was probably a nod to an earlier kind of costume. I can’t recall the scene, but it’s two to one it was a nod to folk costumes. And I’d be interested to know how the difference between laced bodices in folk costumes (worn outside) and stays/corsets (worn inside) came about, too… especially seeing as Leimomi mentions that at one time, outer garments with boning in them were more proper than boned undergarments. When boned garments were outer or underwear depends on the garment, and is a class, cultural AND period specific thing! I’ve covered one aspect of it (Swiss waists) in the post linked at the very top of this post. They had to have hand-worked eyelets, and no visible boning channels, or they were undergarments. The early fully boned garments are actally quite similar (Ninon’s dress is an example of the fully boned bodice that was formalised as court wear) in that you can’t see the boning channels. In terms of class, English peasants wore stays as outerwear to do work without comment throughout the 18th century, though I doubt it would have been acceptable church wear etc. Based on what I can find out, French ladies were more likely to receive visitors in just their stays than their English counterparts. It would definitely be a sign of informality and intimacy – somewhat analogous to hanging out with people with your shoes off. There are places (Hawaii) where it is totally expected, places where it is unremarkable, and places where you’d have to really know the person to see them without shoes. It i sindeed a big cultural difference here. 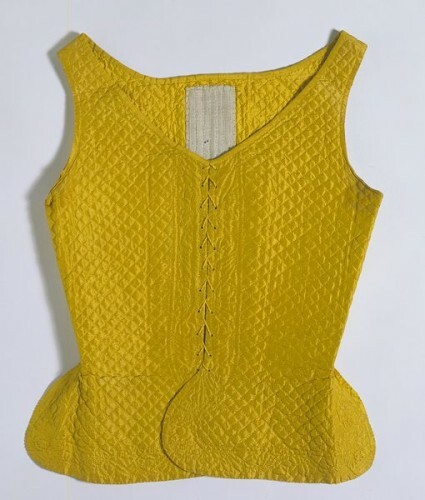 swedish commoners wore a bodice as outwear thoughout the 18th century (and the 19th century as well). The cut could be very much like a pair of stays and be more or less boned (sometimes with visible boning channels, especially the lather ones), depending on were in Sweden they were born. Thery could be made in leather, wool, linen and even cotton. Some of them look remarkably like the much derided “wench-wear”. 🙂 They were worn visibly or covered with a short gown and jacket. Ususally you covered them up for church as you put on your finery for that, but there are mentions in the early 19th century of women going to church with “bare arms” (just covered with their shifts, that is), but that seemed to have been a rather local custom. Most interesting! ‘Jumps’ were completely new to me. To extend the use of ‘stays’ and ‘corsets’, my grandmother wore these (two pieces, full body length including bust, in a sort of surgical pink colour) until she died in 1985. She (and we) used the terms interchangeably. Ahah! A holdover! I think the use of stays stayed longer as a more common term in NZ than in the US, for example. I’ll have to ask my MIL if they called her grandmother’s corsets (which she wore until she died in the late 1970s) stays. Leimomi, you’re priceless! This is the sort of thing I have been wondering about ever since I came across the terms stays and jumps (perhaps even more so as a non-native speaker)! …Awww … thank you! I’m so pleased it was helpful! I’m sure it is really confusing in another language, especially as people have never been particularly precise about clothing terms. Oh yes! I’d love to read about the distinctions in Czech! I’d have to figure out what sources to use first… there’s a lot less available in Czech. Very interesting! Do you have any particular reason for deriving ‘stays’ from the French rather than the old-fashioned English ‘stay’ (as in ‘stay me with flagons and comfort me with apples’)? Well, every source I have found suggests estayer as the origin, so I’m dependent on the wisdom and research of those more knowledgeable here. Also, in that context isn’t stay a synonym for sustain? Other translations of the Song of Solomon use ‘sustain me with flaggons (or raisins)’, and I can’t imagine why a corset would sustain you in the same way food does. My Oxford English Dictionary supports the origin from the French verb ‘estayer’, to steady or support something. So costume ‘stays’ join all those other stays and supports holding up ships and buildings and plants. The earliest citation of the use of our ‘stays’ is from 1608.
staylace.comGreat post! This particular bit of terminology has always confused me. How fascinating that ladies were only required stays at court. I guess it would be easy to get away with not wearing stays in the softer styles of the 80s and 90s. I’ve found that my drawstring jacket fits almost as well without stays as it does with them. I didn’t know that “stays” and “corset” were interchangeable terms for so long. I found some Ana Held quotes a while ago and was quite puzzled by her frequent use of the word “stays”. Thank you for clearing up all the confusion! Thanks! I think a lot of the not wearing stays was under robe battante or the sort of loose jackets shown in Arnold, and women were less likely to be painted in these. Look at a lot of Watteau’s work though, and it’s easy to see how the women needn’t have been wearing stays under their dresses. There is a difference between being required to wear stays at court, and ONLY being required to wear stays at court. I suspect most wealthy French women would have worn stays on a pretty regular basis (though evidence suggests they were never as commonly worn in France as in Britain), but there was a code of dress for court, and it specifically mentions stays as a requirement unless the lady was unable to wear them. In the same way, Victorian court presentation dress required white gloves, but most ladies would wear white gloves to most events, although other colours were permitted. Make sense? P.S. I’d be a little wary of staylace – a lot of the research is dependent on VERY old and rather shady writing. Lots of the sort of early 20th century blithe quoting of Victorian fetish writing as fact, and pseudo-histories that Steele and others have so thoroughly disproven. I’m currently going through the published letters of Lady Mary Wortley Montagu (say that 10x fast!) for research and just yesterday came across a note she made about this very thing. It was 1740-ish, she was in France (and had been on the Continent for a few years by this point) and referring to young English ladies that I suppose had relatively recently arrived. She made some compliment about them that they represented England well, or some such, but that she didn’t think the French ladies would be adopting their stiff-bodied fashions any time soon. As an aside – I examined that set of stays in the Manchester collection you pictured here. They are much more beautiful in-person and in absolutely perfect condition. They’re really quite breathtaking. Why can’t we get wool damask like that today!? Thank you. It does make sense that the wealthy would wear stays more regularly. I guess I didn’t word that sentence very well. Thank you for so patiently correcting me whenever I leave foolish comments, I really appreciate it. Very interesting post! Love the insight and especially the pictures. That is a particularly pretty corded corset isn’t it? I find the bone eyelets particularly fascinating, and have been on the lookout for other garments with them, as a transition between thread bound eyelets and the post 1829 metal eyelets. One of the citations is from 1825-80 Jamieson, ‘Jumps, a kind of easy stays , open before, worn by nurses.’ (ie nursing mothers.) That’s sensible, isn’t it? You couldn’t wear “incommodious stays” when you were breast-feeding. A sort of nursing bra for the times. Oh you clever woman! I got so caught up in reading all the history books that I forgot to go to the basic – the dictionary! Thank you! And if you don’t mind, I’ll edit and incorporate some of this into the article so it’s all there. 🙂 Delighted to have been helpful! Remember, I’m your crazy friend with the twenty-volume Oxford – the one with all the citations. What a cool article–and a wonderful conversation that followed. So, big news: I’m expecting! Yay! But then I couldn’t help reading this article wondering how other women in my position would have navigated support, tidiness, and clothing at the time. Great post! I hadn’t realised the vagaries of how the terms were not entirely interchangeable at different times. Another terminology thing you may not be aware of: “pair” originally could mean either “a couple (i.e. a set of two)” OR “a set, greater than two”. So, a “pair of bodies” could refer to two halves, or it could refer to a set. This is also seen in the term “pair of plates” to mean the same thing as “coat of plates” in late 13th C and 14th C armour – a transitional form of armour consisting of several (usually more than two) metal plates rivetted inside a fabric or leather garment. I need to make a set of stays for the mid 18-teens. Do you have a recommendation for a pattern? Thanks! gbacg.org I personally haven’t made a pattern that I was totally happy with, but you might check out the reviews at the GBACG Great Pattern Review, as they are very helpful. I think you may have left out a word (forgive me if I’m misunderstanding, I just woke up…). Did you mean that corsets were originally less rigid than stays? 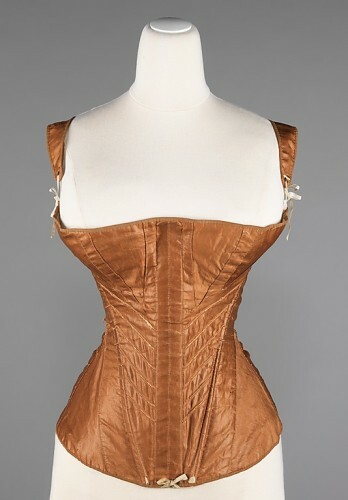 It’s fascinating how corsets developed over the decades; I wasn’t previously aware of that! This post brought back memories of my corset hating grandma- she referred to corsets as ‘boa-constrictors’ and never wore one after she married in 1914. She was a slim woman and didn’t need them anyway. The various ‘supports’ that appeared later she also despised – anyone else remember the ‘roll-on’? -known to Grandma as the ‘roll-up’, because it did. Then there was the ‘easy’ – which was anything but. Grandma relied on a simple suspender belt to keep up her stockings, and embraced tights with glee. She was a woman ahead of her time! Thank you…as always I learned something I had no previous knowledge of, that is Victorian fetish writing. Sonething I’ll do a bit of reading about. I do have a querry, and if you have answered this before, I apologise. What is the earliest that torso, form fitting supports (you notice that I am intentionally avoiding specific terminology) were worn? Why? It seems that there must have been a practical reason for the practice to last for such a long time. Fasion alone seems unlikly. This is a great article but I’m still a bit confused. I reenact a poorer person working with a wagoner. I don’t wear either a corset or stays as I think a woman doing manual labor wouldn’t, couldn’t do as much, that tightly wrapped. I was told to look into jumps and I like that 1/2 or transitional set and the outer, leather one sounds good, so I’m still confused. What decade and area of the world do you reenact? Period commentators made it clear that English women – even very poor ones, were almost invariably in stays, where it was much less common in France. I’m not sure about the colonies. I’ve done some pretty heavy lifting and work in my stays, and I find they actually help with the manual labour – they provide back support all day long. I doubt working women’s stays were that tightly laced though.